Jim Elliott came to the Trinity Valley SBDC in 2011. The office assisted in preparing a loan request package for his brewery startup. Jim had been a school teacher with a hobby of home brewing beer. Once the projections had been completed, documents collected and the presentation assembled, Jim set about to find a lender. It was a time of tough lending standards. Repeatedly, banks called for higher equity injections. In fact, the City of Kemp donated land in their downtown to use as equity in the deal and as an incentive to locate the business there. The local bank under-appraised the parcel and Jim returned the land to the Kemp EDC. He continued his search, eventually being rejected by sixteen different banks. SBDC Counselor Pam Holland suggested several other banks and remained in contact with Jim as he went from lender to lender. The SBDC revised cash flow projections based on revisions as he went along. Jim exhibited the wisdom necessary to many entrepreneurs — 70% of something is worth more than 100% of nothing. He set about using social media to raise the $200,000 he needed to go with his equity position. In the process, he surrendered 30% of his ownership for the necessary funds to get his license and open up in Seven Points, Texas. 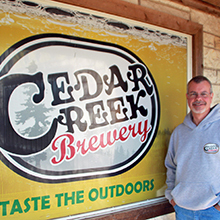 Opening in the fall of 2012, he started with a brewmaster and himself. As time passed, Jim has continually reinvested in additional equipment and upgrades to the building he rents with a purchase option. He has added three new employees and with recent developments, will be adding more. The building now has a beer garden and on Saturdays, a local caterer sets up a truck to provide barbeque and live music is offered. The front room has also been upgraded for tastings. Weekend visitors come to the brewery as it grows into the tourist attraction Kemp expected it to be, but Seven Points realized.